Durability is unarguably one of the most significant advantages of a metal roof. Nothing can beat a steel roof for longevity. How come metal roofing last so long? Surveys published by both MetalConstruction.org and Buildings.com, apart from showing the durability of existing metal roofs, provide cost comparisons too. The typical metal roof carries a warranty of 40 years, much longer than a similar traditional roof. Findings by the Metal Construction Association show that metal roofs last for 60 years and longer. Compare that with 20 years for a single-ply roof and 23 years for an asphalt shingle roof. The double lifespan is quite impressive, but it does not address cost, which is the biggest concern. A survey by Ducker Research Company showed that a metal roof’s lifespan averaged approximately 30 Cents per square foot. The same company found the comparative lifecycle costs for single-ply and asphalt roofs to be 57 Cents and 37 Cents per square foot respectively. The survey further determined that the cost of a metal roof was 2.5% of the total installed cost, while single-ply was approximately 19% and asphalt was about 38.5% of the total cost. You need to know the difference in costs, as knowing how long something lasts is not enough. Why does metal roofing have a long life? Metal is a durable material as we stated before. However, durability by itself cannot account for longevity. 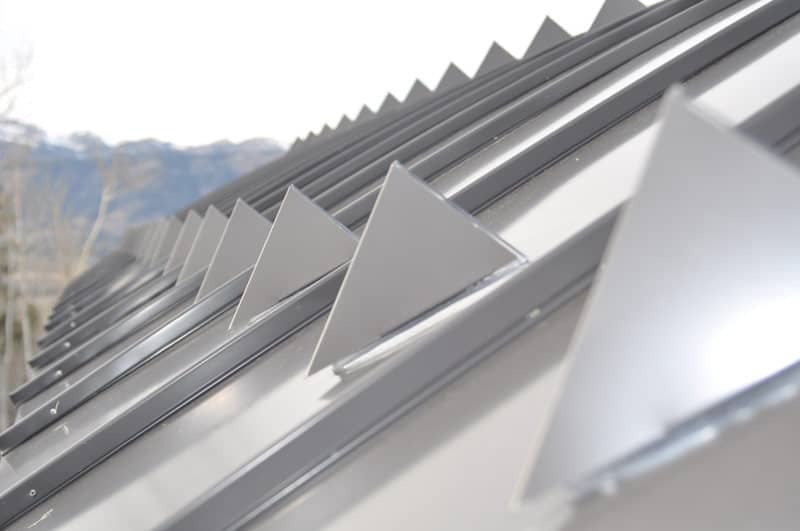 A metal roof is not just a series of steel panels; it is an entire system comprising framing members and clips, all of which determine the longevity of the roof. Roof clips leave enough “wiggle room” for the panels to shift with the contraction and expansion caused by temperature changes, every day and from season to season and they hold the roof panels to the structural members securely too. Further improvements to longevity include heavy-duty fasteners and sealants at the seams. Factory punching makes sure that the panels align properly and alleviates the danger of corrosion at the hole edges. Splices are staggered to prevent leak points and completely exposed seams. Roof openings and curbs are factory engineered too. To eliminate the potential for leaks the fasteners are concealed inside the curbs. 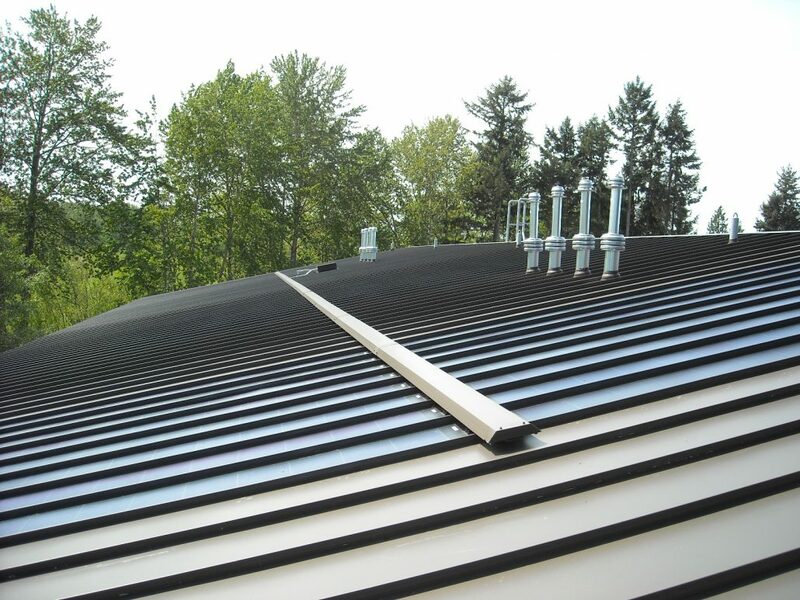 Metal is much more resistant to the environment than asphalt and other conventional roofing materials. It can withstand severe weather conditions and high winds that would tear apart an asphalt roof. Metal is also impact resistant, so even a hail storm does not damage it. As metal is resistant to fire too, there are little chances that the house will burn if lightning strikes a home with a metal roof. In such a scenario, the electrical charge is spread over the roof. The metal is also more than able to withstand the lightning bolt’s heat at the point of contact. Metal is resistant to seismic activity too. In such a scenario, the metal may buckle, but it will not shatter or splinter. Another important aspect is that metal is pest proof. Metal is highly sustainable. Most steel available today contains a high portion of recycled steel. Metal is 100% recyclable, which is not the case with asphalt shingles, which need to be sent to a landfill when removed. Metal roofs, being durable, do not require frequent replacement, diminishing fuel usage and pollution from heavy equipment manufacturers. Light color coated metal roofs conserve energy in two ways due to their emissivity and reflectivity ratings. Air conditioners require less effort when heat is reflected away from a building. Heat reflected back into the building keeps the rooms warm and cost without inflating energy consumption by heaters. Metal roofs offer another way to keep the indoor environment comfortable as they can be more densely insulated than traditional roofs. Metal roofs facilitate mounting of unique skylights and solar panels, as they require fewer penetrations as well as decrease the amount of cut edge exposed to corrosive environment. Steel roofs help you save on insurance and improves your property value. Insurance companies think about a metal roof as a better risk and charge lower premiums because of the metal’s durability and resistivity to fire. It is also possible to change the texture and color of metal roofing materials to make them look like any other material. Enhance the durability of your metal roof by cleaning the accumulated debris and dust annually to prevent water accumulation. You should replace corroded fasteners as well to increase the longevity of your roof. Check the shape of the flashing around the roof penetrations and repaint dents and scratches. Installed and maintained correctly, a metal roof provides years of service and costs less in the long run. Ensure your metal roof lasts for a minimum of 40 years by taking appropriate maintenance steps as well as adding the proper flashing at penetration points. The higher initial cost of a metal roof offers more return on investment in the long run, compared to traditional roofs. Savings on wear and tear on heating and air conditioning units, utilities, as well as savings on insurance premiums, make metal roofs the ideal choice. Making asphalt roofs look like a bad deal. Save money, conserve energy, and be environmentally friendly by opting for steel for your roof the next time you need a reroofing done.